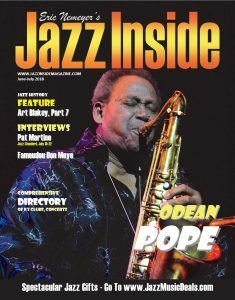 ​DOWNLOAD Jazz Inside Magazine March-April 2019 digital version here. 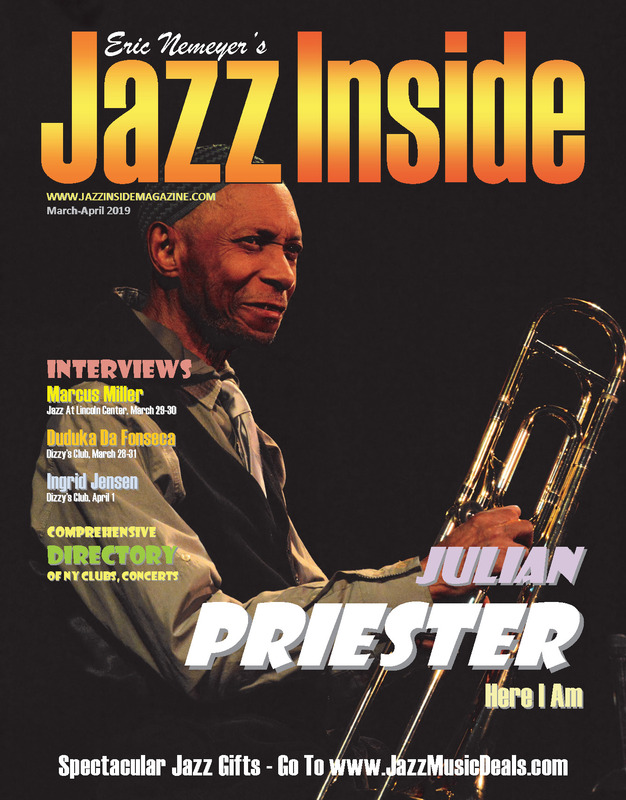 In this issue (print and digital) we feature trombonist Julian Priester in an interview by Ken Weiss; bassist Marcus Miller; saxophonist Ernie Watts; trumpeter Ingrid Jensen; and drummer Duduka DaFonseca. The calendar section includes scores of jazz club, jazz concert and event listings for the New York tri-state area. 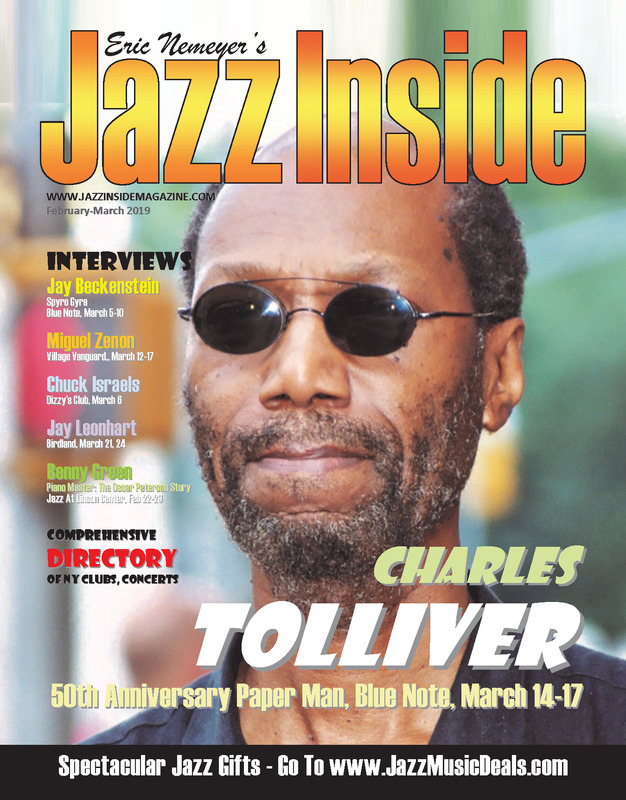 ​DOWNLOAD Jazz Inside Magazine February-March 2019 digital version here. In this issue (print and digital) we feature saxophonist Charles Tolliver, Chuck Israels, Jay Beckenstein, Benny Green and Miguel Zenon. The calendar section includes scores of jazz club, jazz concert and event listings for the New York tri-state area. 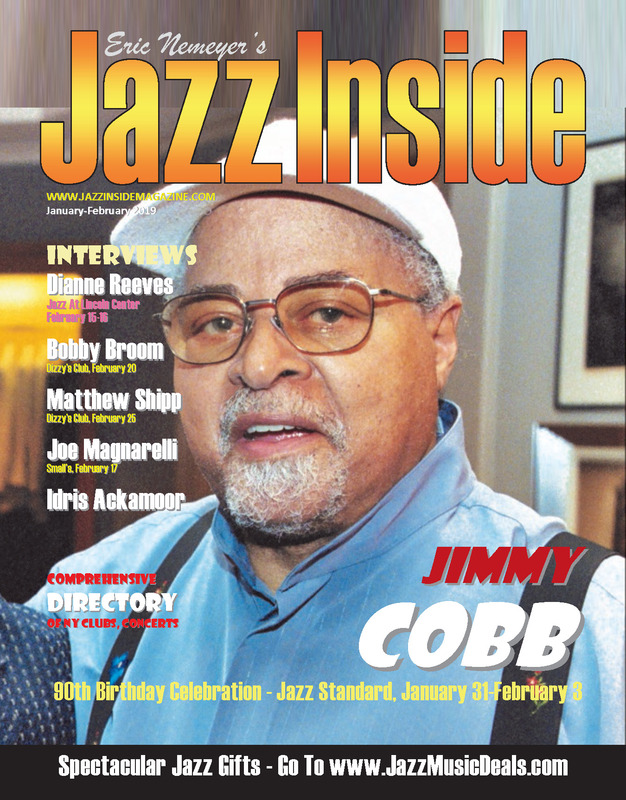 ​DOWNLOAD Jazz Inside Magazine January-February 2019 digital version here. In this issue (print and digital) we feature saxophonist Idris Ackamoor by Ken Weiss, trumpeters Joe Magnarelli, Charles Tolliver, guitarist Bobby Broom and vocalist and 2018 NEA Jazz Master Dianne Reeves. The calendar section includes scores of jazz club, jazz concert and event listings for the New York tri-state area. ​DOWNLOAD Jazz Inside Magazine December 2018 digital version here. 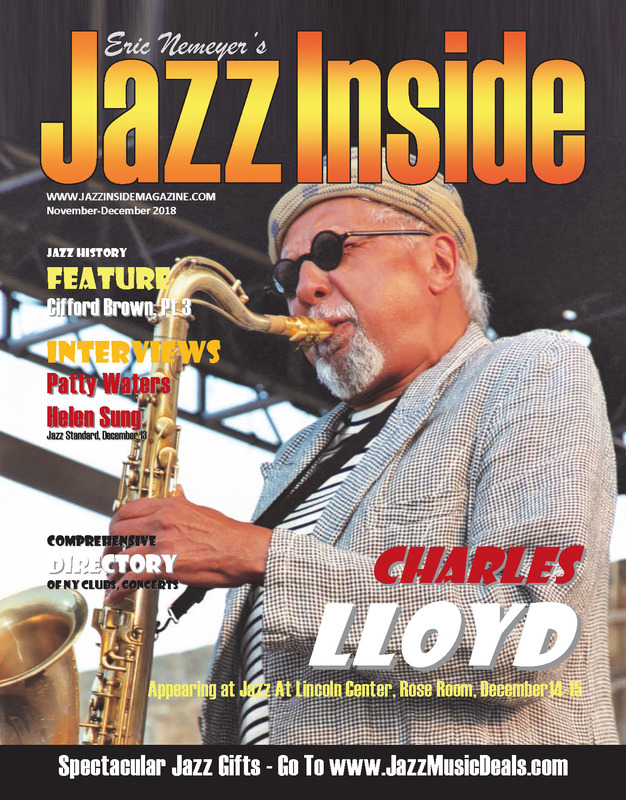 In this issue (print and digital) we feature saxophonist Charles LLoyd on the cover with an interview and photos. Additional Interviews include jazz pianist Helen Sung (Jazz Standard, December 13) and vocalist Patty Waters by Ken Weiss, as well as Part 3 of the Jazz History Feature on Clifford Brown. The calendar section includes scores of jazz club, jazz concert and event listings for the New York tri-state area. ​DOWNLOAD Jazz Inside Magazine October-November 2018 digital version here. 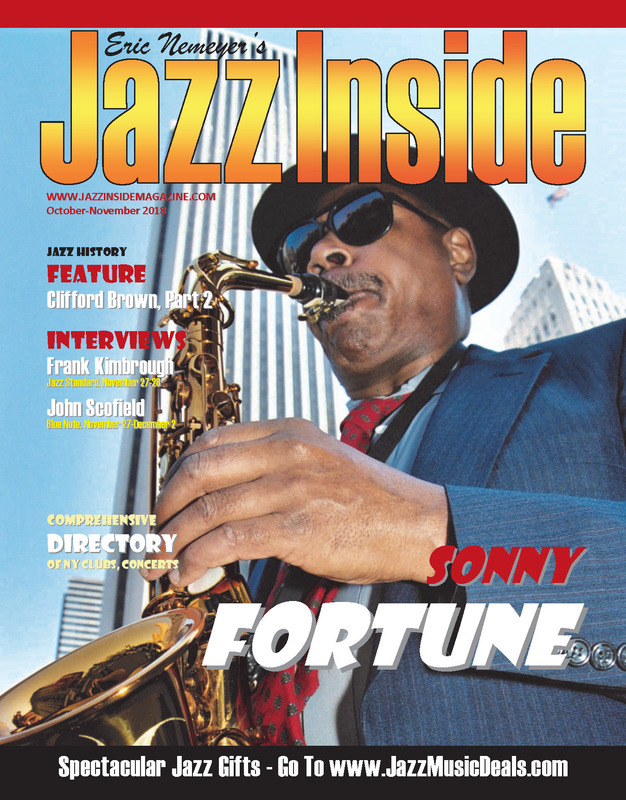 In this issue (print and digital) we feature the late saxophonist Sonny Fortune on the cover with an interview and photos. Additional Interviews include jazz pianist Frank Kimbrough (Jazz Standard, November 27-28) and guitarist John Scofield (Blue Note, November 27-December 2) as well as Part 2 of the Jazz History Feature on Clifford Brown. The calendar section includes scores of jazz club, jazz concert and event listings for the New York tri-state area. ​DOWNLOAD Jazz Inside Magazine September-October 2018 digital version here. In this issue (print and digital) we feature guitarist Richard Wyands on the cover with an interview and photo by Ken Weiss. Additional Interviews include jazz saxophonist Scott Robinson (Jazz Standard, October 31) and drummer Matt Wilson (Dizzy's Club, October 12-13) as well as Part 1 of the Jazz History Feature on Clifford Brown; and a photo gallery of the 2018 Charlie Parker Festival. The calendar section includes scores of jazz club, jazz concert and event listings for the New York tri-state area. ​DOWNLOAD Jazz Inside Magazine August-September 2018 digital version here. 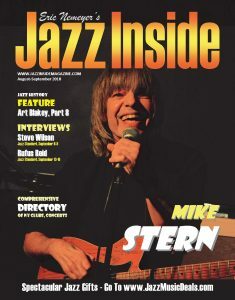 In this issue (print and digital) we feature guitarist Mike Stern on the cover with an interview and photo by Ken Weiss. Additional Interviews include jazz saxophonist Steve Wilson (Jazz Standard, September 6-9), bassist Rufus Reid (Jazz Standard, September 13-16) as well as Part 8 of the Jazz History Feature on Art Blakey. The calendar section includes scores of jazz club, jazz concert and event listings for the New York tri-state area. ​DOWNLOAD Jazz Inside Magazine June-July 2018 digital version here. In this issue (print and digital) we feature saxophonist, composer, Odean Pope on the cover with an interview and photo by Ken Weiss. Additional Interviews include jazz guitarist Pat Martino (Jazz Standard, July 19-22), percussionist, drummer, Famoudou Don Moye, as well as Part 7 of the Jazz History Feature on Art Blakey. The calendar section includes scores of jazz club, jazz concert and event listings for the New York tri-state area. ​DOWNLOAD Jazz Inside Magazine May-June 2018 digital version here. 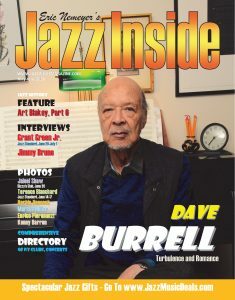 In this issue (print and digital) we feature pianist, composer, Dave Burrell on the cover with an interview and photo by Ken Weiss. Additional Interviews include jazz guitarists Grant Green Jr. (Jazz Standard, June 27-July 1), Jimmy Bruno, as well as Part 6 of the Jazz History Feature on Art Blakey. There are also photos of saxophonist Jaleel Shaw (appearing with Shamie Royston, June 20, Dizzy's), Herbie Hancock, Terence Blanchard, Enrico, Pieranunzi, Kenny Barron, Marcus Miller. The calendar section includes scores of jazz club, jazz concert and event listings for the New York tri-state area. ​DOWNLOAD Jazz Inside Magazine April-May 2018 ​digital version here. 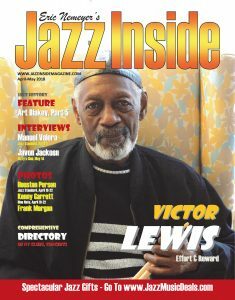 In this issue (print and digital) we feature drummer, composer Victor Lewis on the cover with an interview and photos by Ken Weiss. Additional Interviews include jazz pianist Manuel Valera (Jazz Standard, April 11), jazz saxophonist Javon Jackson (Dizzy's Club, May 14, Village Vanguard, April 24-29), as well as Part 5 of the Jazz History Feature on Art Blakey. There are also photos of saxophonist Houston Person (Jazz Standard, April 22-25), saxophonist Kenny Garrett (Blue Note, April 22-25). The calendar section includes scores of jazz club, jazz concert and event listings for the New York tri-state area..
​​DOWNLOAD Jazz Inside Magazine March-April 2018 digital version here. 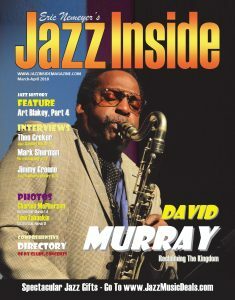 In this issue (print and digital) we feature saxophonist, composer David Murray on the cover with an interview and photos by Ken Weiss. Additional Interviews include vibraphonist Mark Sherman (Dizzy's Club, March 14), trumpeter Theo Croker (Jazz Standard, March 13), Jimmy Greene (Jazz Standard, March 15-18); as well as Part 4 of the Jazz History Feature on Art Blakey. There are also photos of saxophonist Lew Tabackin (Dizzy's Club, March 13, April 4), saxophonist Charles McPherson (Dizzy's Club, March 1-4). The calendar section includes scores of jazz club, jazz concert and event listings for the New York tri-state area. ​DOWNLOAD Jazz Inside Magazine January-February 2018 digital version here. 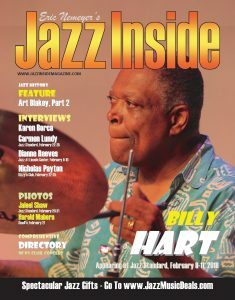 In this issue (print and digital) we feature drummer Billy Hart on the cover. Interviews include trumpeter Nicholas Payton (Dizzy's Club, February 22-25), vocalists Dianne Reeves (Jazz At Lincoln Center, February 9-10), Carmen Lundy (Jazz Standard, February 22-25); as well as Part 2 of the Jazz History Feature on Art Blakey. There are also photos of saxophonist Jaleel Shaw (Jazz Standard, February 20-21), pianist Harold Mabern (Small's, February 21). The calendar section includes scores of jazz club, jazz concert and event listings for the New York tri-state area. ​DOWNLOAD Jazz Inside Magazine December-January 2018 digital version here. 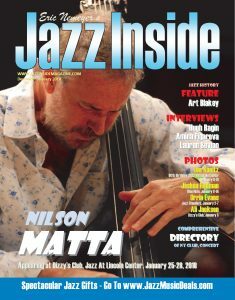 In this issue (print and digital) we feature bassist Nilson Matta on the cover. Interviews include trumpeter and composer Hugh Ragin, pianist Amina Figarova and baritone saxophonist Lauren Sevian; as well as Part 1 of the Jazz History Feature on Art Blakey. There are also photos of saxophonist Joshua Redman, pianist Orrin Evans (appearing with his small group and big band at Jazz Standard, January 2-7), saxophonist Lee Konitz celebrating his 90th birthday at Dizzy's Club in New York, January 9-10, and Jazz At Lincoln Center drummer Ali Jackson. The calendar section includes scores of jazz club, jazz concert and event listings for the New York tri-state area. ​DOWNLOAD Jazz Inside Magazine November-December 2017 digital version here. 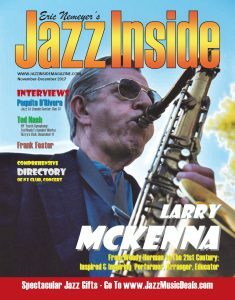 In this issue (print and digital) we feature saxophonist, arranger, educator Larry McKenna on the cover. Other interviews include the late saxophonist, composer, arranger Frank Foster, who also led the Count Basie Orchestra in the 1980s; saxophonist, composer, arranger and member of the Jazz At Lincoln Center Orchestra, Ted Nash; and saxophonist Paquito D'Rivera. The calendar section includes scores of jazz club, jazz concert and event listings for the New York tri-state area. ​DOWNLOAD Jazz Inside Magazine, October-November 2017 digital version here. 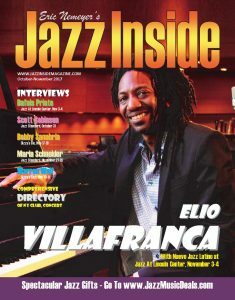 In this issue (print and digital) we feature pianist Elio Villafranca on the cover. Other interviews include drummer Dafnis Prieto, saxophonist Scott Robinson, drummer, educator Bobby Sanabria, vibraphonist Warren Wolf, composer/arranger Maria Schneider. The calendar section includes scores of jazz club, jazz concert and event listings for the New York tri-state area. ​​DOWNLOAD Jazz Inside Magazine, September-October 2017 digital version here. 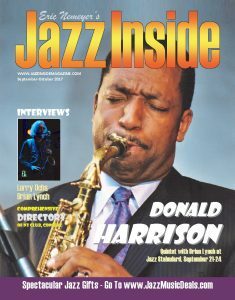 In this issue (print and digital) we feature saxophonist Donald Harrison on the cover. He discusses his work with Art Blakey and The Jazz Messengers, Roy Haynes, his association with notable hip-hop artists, composing for large orchestra and more. Harrison will be performing with his quintet along with Brian Lynch (whose interview also appears in this issue) at Jazz Standard in New York, September 21-24. Ken Weiss interviews saxophonist Larry Ochs. The calendar section includes scores of jazz club, jazz concert and event listings for the New York tri-state area. ​​​DOWNLOAD Jazz Inside Magazine, August-September 2017 digital version here. 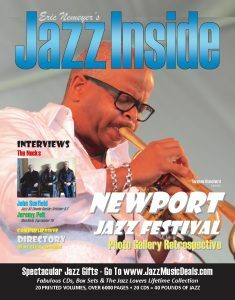 In this issue (print and digital) we feature a Newport Jazz Festival Photo Gallery and Retrospective, with images of Herbie Hancock, Wayne Shorter, Hiromi, Marcus Miller, Tia Fuller, Gregory Porter, George Wein, Lionel Loueke, Ron Carter, James Moody, Phil Woods, Jackie McLean, Jimmy Heath, Percy Heath, Albert Heath, Bill Charlap, Michael Brecker, Ravi Coltrane, McCoy Tuner, Roy Haynes plus Terence Blanchard pictured on the cover, Interviews include the Australian group The Necks by Ken Weiss; guitarist John Scofield who will be appearing with the group Hudson at Jazz At Lincoln Center on October 6 and 7; and trumpeter Jeremy Pelt, appearing at the Blue Note, September 18. The calendar section includes scores of jazz club, jazz concert and event listings for the New York tri-state area. ​​​DOWNLOAD Jazz Inside Magazine, June-July 2017 digital version here. 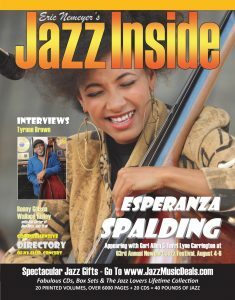 In this issue (print and digital) we feature bassist, vocalist, composer Esperanza Spalding on the cover in concert with her appearance at the Newport Jazz Festival, August 4-6. Other interviews this issue include Philadelphia bassist Tyrone Brown (by Ken Weiss) whose noteworthy career has included extended associations with Max Roach, Grover Washington Jr. (on whose Gold Records he performed), Pat Martino, Lou Rawls, Catalyst and others. There are also interviews with saxophonist, composer Benny Golson and Wallace Roney. The calendar section includes scores of jazz club, jazz concert and event listings for the New York tri-state area. ​​​DOWNLOAD Jazz Inside Magazine, May-June 2017 digital version here. 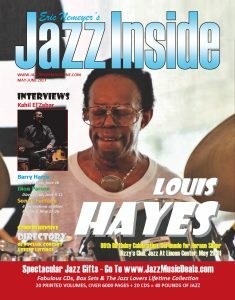 In this issue (print and digital) we feature Louis Hayes on the cover in celebration of his 80th birthday and performance at Dizzy's Club. Louis Hayes broke in to the music with Horace Silver's Quintet upon moving to New York at age 19. Among his other notable associations were stints with Cannonball Adderley, Oscar Peterson's Trio, Dexter Gordon, recordings with John Coltrane and more. Other interviews this issue include Kahil E'Zabar (by Ken Weiss), Barry Harris, Sonny Fortune. The calendar section includes scores of jazz club, jazz concert and event listings for the New York tri-state area. ​​​DOWNLOAD Jazz Inside Magazine, March 2017. 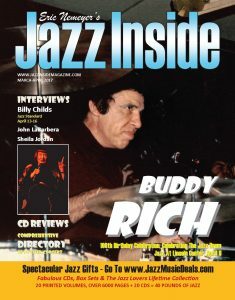 ​In this issue (print and digital) we feature Buddy Rich on the cover in celebration of his 100th birthday. Detailed interviews with arranger, composer, trumpeter John LaBarbera and Buddy's road manager Steve Peck provide unique insights into Buddy Rich the drummer, bandleader, talent-finder, motivator, incessant reader, and quietly generous friend. John LaBarbera played trumpet in Buddy's big band in the late 1960s, and was selected by Buddy to arrange the music for albums including Different Drummer, Rich In London, Stick It. 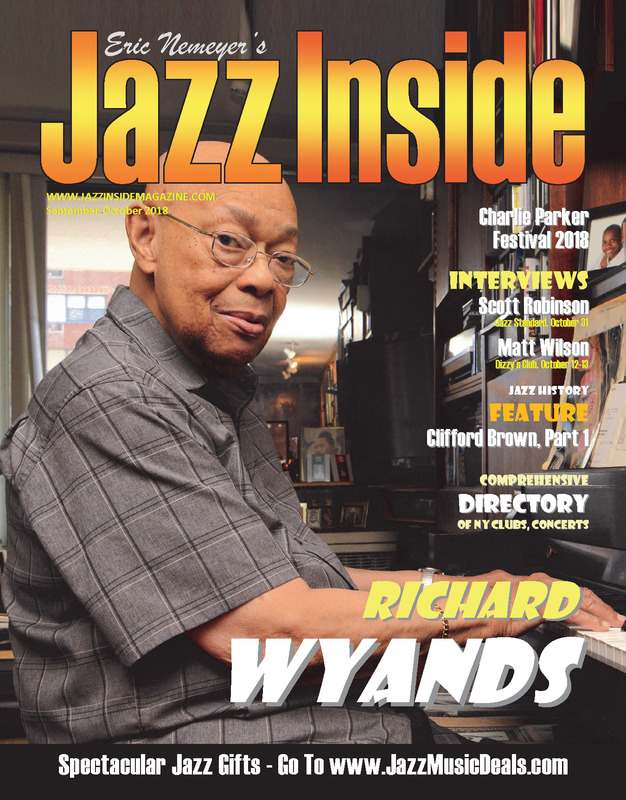 Other artist interviews include pianist Billy Childs, appearing with his group at Jazz Standard in New York (April 13-16), and a lengthy interview with Sheila Jordan by Ken Weiss, in which she discusses her close friendship with Charlie "Bird" Parker and her many experiences in the music world. The calendar section includes scores of jazz club, jazz concert and event listings for the New York tri-state area. ​​​DOWNLOAD Jazz Inside Magazine, February-March 2017 digital version here. 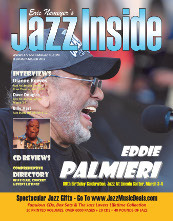 In this issue (print and digital) we feature pianist Eddie Palmieri on the cover. Other interviews this issue include vocalist Dianne Reeves, trumpeter Dave Douglas and others. The calendar section includes scores of jazz club, jazz concert and event listings for the New York tri-state area. ​​​DOWNLOAD Jazz Inside Magazine, December-January 2017 digital version here. 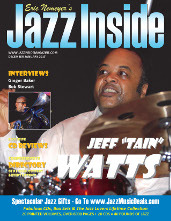 In this issue (print and digital) we feature drummers Jeff Tain Watts, Ginger Baker, and tuba player Bob Stewart. The calendar section includes scores of jazz club, jazz concert and event listings for the New York tri-state area.